Managing manual processes, document reviews and approvals, employee-related tasks, and internal and external communication points can be overwhelming, time-consuming, and sometimes overly complicated. All these steps and processes, if left un-managed and done manually, can lead to poor performance and delays and untimely cause higher operational costs and client dissatisfaction. Take the HR Employee Onboarding process as an example: recruiting, hiring, provisioning then giving the new hire access to systems and training materials requires cross-departmental coordination, piles of paperwork, and multiple internal and external processes. Having the ability to quickly and easily turn time-consuming, manual steps into automated, efficient workflows could mean that your recruiting and HR teams can now focus on locating great people, making them feel welcome, and enabling them to contribute more quickly. Business Process Automation (BPA) is a powerful tool for increasing productivity and optimizing operations while decreasing the time/money/human resources required to complete routine and time-consuming tasks. Human Resources: Expedite recruiting and onboarding, manage PTO requests and performance reviews, internal surveys, reduce paperwork and administrative costs. Information Technology: Provision user accounts, manage and track IT assets, manage help desk requests, track projects and improve quality control and testing. Marketing: Plan campaigns and events, review and approve content and collateral. Sales: Manage RFP’s and contracts, engage more with customers through managing customers queries and feedback. Finance: Simplify budget requests and expense approvals, invoice processing, improve data accuracy and visibility, ensure regulatory compliance and reduce risk. Procurement: Manage purchase orders and service agreements, optimize vendor management. Facilities: Organize work orders and lease agreements, manage move in/move out requests. Company assets and processes: When evaluating process automation, it is important to look at critical assets and processes across the enterprise. The most important departments to look at first are the ones that drive revenue and/or impact customers. Company size and maturity: Select a solution that is right for the size of your organization and the maturity level you are at to implement and truly adopt the solution. Small businesses and multinational enterprises have very different needs. Price/budget: Applications are an investment. Calculate the payback period and ROI and evaluate the lifetime cost in terms of time, resources, maintenance, and support. Integration: List existing platforms and systems that will need to connect to the new application and ensure that the new platform will integrate with these applications. Deployment: Is the new technology cloud-based and available across devices? Can the user build forms and design workflows without programming or coding skills, or does the application require time-consuming custom development by highly skilled (and sometimes hard to find) IT resources? In this article, we look at one of the industry-leading process optimization & automation solutions, called Nintex. 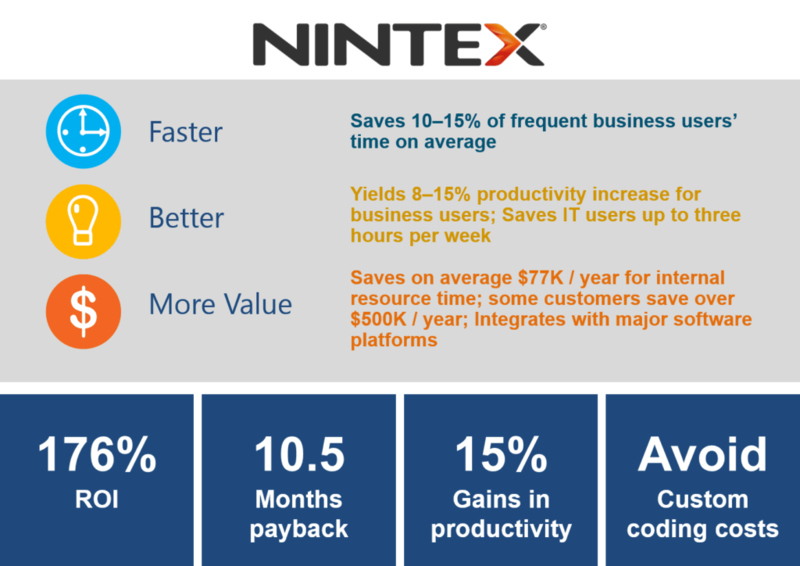 Nintex is a comprehensive business-user friendly solution that offers the best of both worlds with browser-based, drag-and-drop technology that integrates with powerful applications such as Office 365, SharePoint, Salesforce, SAP and much more to provide an intelligent workflow automation engine. Using Nintex, organizations can streamline and automate their everyday processes resulting in simplified communications, error reduction, time and cost savings, and greater compliance and accuracy. Organizations that automate workflows are more efficient, more productive and more engaged with customers because they’re not bogged down by manual, time-consuming processes. 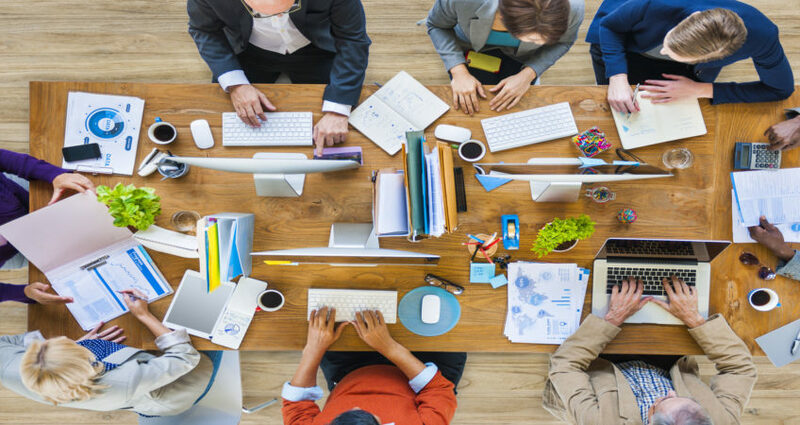 Business process automation can also boost employee satisfaction by enabling mobility and freeing staff to focus on more creative and strategic work. Business process automation can enable organizations of any size to increase productivity, streamline operations and gain competitive advantage. A clear vision of organizational goals combined with right technology can be the starting point for continuous improvement and a level of organizational efficiency that makes working with your business a pleasure. At Optimum, we help organizations streamline and automate their everyday business processes, resulting in simplified communication, error reduction, time and cost savings, and greater compliance and accuracy. By utilizing our in-house Business Process Management and Optimization expertise and using point-and-click workflow automation solutions such as Nintex, we help our clients tackle everything from automating workflows and forms, to document generation, management and approvals, and integration with the world’s largest technology ecosystems including SharePoint/Office 365, Salesforce, SAP, Dynamics, DocuSign, Box and other enterprise services platforms. Contact us for a free consultation to see how we can help you streamline and automate your processes and workflows.